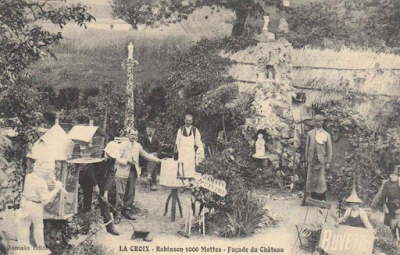 Some French art environments are almost exclusively known because of postcards dating from the beginning of the 20th century ¹. This also applies to a site that has existed in the small municipality of La Croix-en-Touraine, located along the river Cher in the Loire Valley, near the famous Chenonceau castle. Camille Jamain is known as the creator of this art environment which has as its central element a richly decorated building that houses a Museum of Curiosities. On the postcards Jamain is presented as a painter. The internet has no biographical information about him, and it also is not known when the Museum was decorated, what kind of curiosities were exhibited inside, when the other parts of the art environment came into being and when the site ceased to exist. Those other parts of the site were also rather curious. 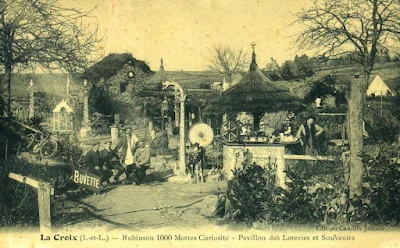 The second photo from above shows an entrance to a passage of the moon and the photo above is the pavilion of the lotteries and souvenirs. The picture above shows the Facade of the castle and the one below shows the Aquarium. The castle could be the structure that is visible next to the standing person on the right of the picture. 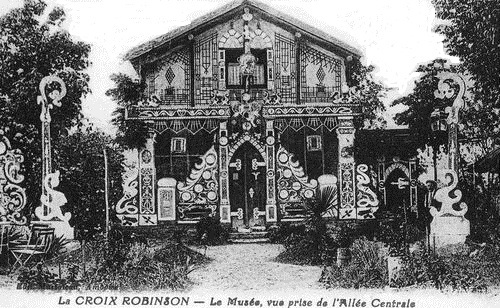 This structure seems to be decorated with rocaille. It includes some sculptures and at the bottom there is a shrine (with a Maria statue ?). 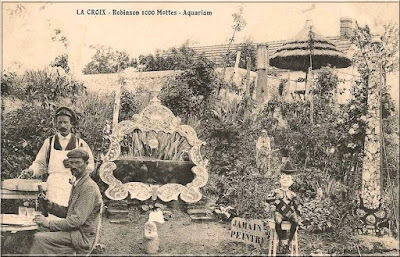 In the photo below there appears to be a small aquarium indeed and the person sitting at the table on the left could be Camille Jamain himself. 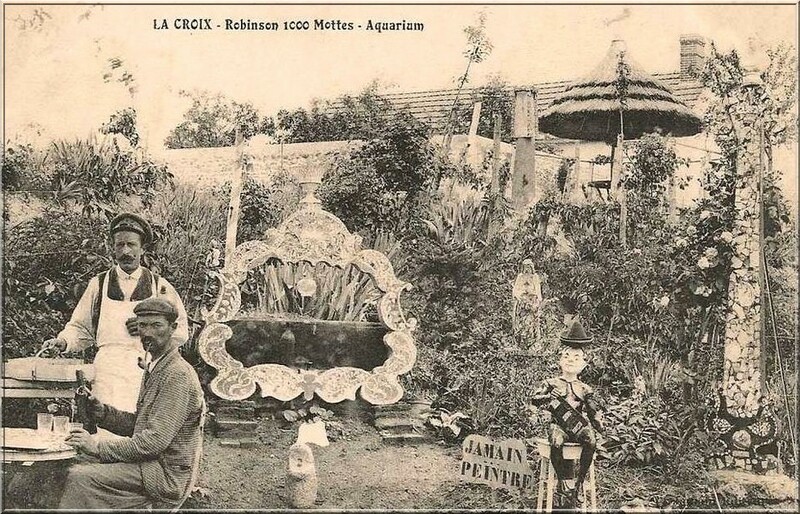 Considering that in the early years of the 20th century when the photos were made, people usually had to pose, the postcards show a lively and cozy atmosphere, so we could assume that this site was kind of a small-scale amusement park. 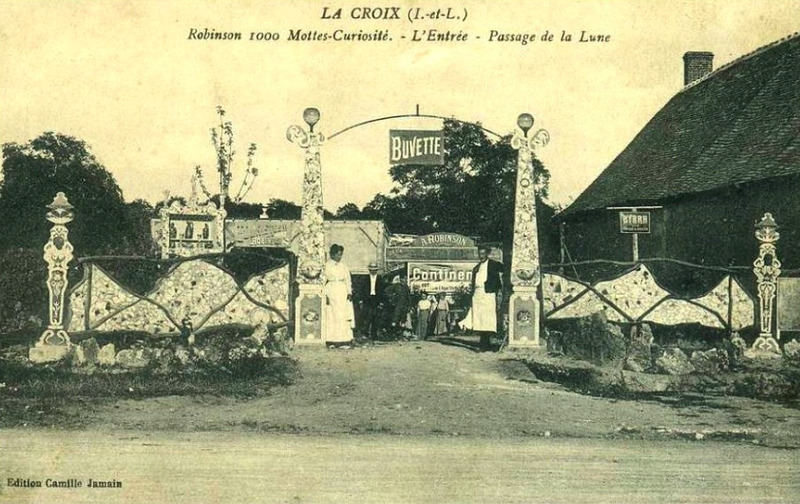 That Jamain himself was the publisher of a number of postcards, that he was promoting his site as très curieux à visiter (very curious to visit) and that there was a buvette (beverage buffet), points out that Jamain had the intention to attract and entertain visitors. On the postcards the site is mentioned as Robinson 1000 mottes, a name I did not use in the title of this post, because I have no idea how to denote that naming and it is also unclear to me what -in the context of this art environment- a correct English translation would be for the french term motte ².